…And now for something completely different. 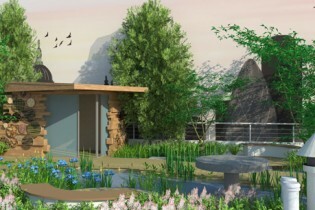 We’ve been approached by The Landscape Agency in York to help with their Blue Water Roof Garden for Chelsea Flower Show. Sponsored by the Royal Bank of Canada, the garden will see us provide a backdrop and a series of extras using materials such as natural and stained wood, glass and a planted roof. The garden will, of course, be judged and we will be ensuring that the quality of the design is carried through on every aspect of the build.